Yitzhak Rabin was an Israeli military Chief of Staff, ambassador to the United States, Minister of Labor and Prime Minister. Rabin (born March 1922, killed November 4, 1995) was born in Jerusalem during the British Mandate over Palestine. His father, Nehemiah, had immigrated to the area from the United States, and in World War I served as a volunteer in the Jewish Legion. His mother, Rosa, was one of the first members of the Haganah, the mainstream Jewish defense organization in Palestine. After completing his schooling with distinction, Rabin volunteered for the Palmach, the commando unit of the Jewish community. He served in the Palmach and the Israeli Defense Forces (I.D.F.) for 27 years, culminating his military career as I.D.F. Chief of Staff. Retiring from I.D.F. service on January 1, 1968, he was appointed Israeli Ambassador to the United States, where he consolidated ties between the two states. Rabin returned to Jerusalem in the Spring of 1973, and became active in the Israel Labor Party. In the December 1973 elections, which followed the Yom Kippur War, he was elected to the Knesset, and when Golda Meir formed her government in April 1974, he was appointed Minister of Labor. This government resigned shortly afterwards, and on June 2, 1974, the Knesset voted confidence in a new government headed by Yitzhak Rabin. As Prime Minister, Rabin placed a special emphasis on improving the economy, solving social problems, and strengthening the IDF. With American mediation, Rabin concluded the interim agreement with Egypt in 1975. As a result of this agreement, the first Memorandum of Understanding was signed between the Government of Israel and the United States. In June 1976, the Rabin government ordered the Entebbe Operation. Following the Labor Party's defeat in the May 1977 elections, Rabin served as a Member of Knesset in the opposition, and was a member of the Knesset Foreign Affairs and Defense Committee, until the formation of the National Unity Government in September 1984. He then served as Minister of Defense in the National Unity Government from September 1984 to March 1990. From March 15, 1990, to June 23, 1992, Rabin served again as a Member of Knesset in the opposition. Before the 1992 elections, the Israel Labor Party held its first nationwide primaries. Rabin was elected Chairman of the Party in February 1992, and in the June 1992 national elections he was elected Prime Minister. On September 13, 1993, Rabin and PLO Chairman Yasser Arafat signed the Declaration of Principles in Washington, D.C., outlining the proposed interim self-government arrangements. The “Gaza­Jericho First” agreement, signed in Cairo on May 4, 1994, addressed the implementation of the first stage of the Declaration of Principles. 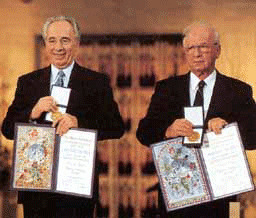 Following the progress in the negotiation with the Palestinians, Rabin received the 1994 Nobel Peace Prize together with Israeli Foreign Minister Shimon Peres and PLO Chairman Yasser Arafat. On October 26, 1994, Rabin and King Hussein signed the Israel-Jordan peace treaty. On November 4, 1995, Yitzhak Rabin joined President Shimon Peres at a large peace rally in Tel Aviv's 'Kings of Israel' square where the Rabin joined with singer Miri Aloni in a rousing rendition of her work called "The Song for Peace." Minutes later, as he was in the midst of leaving the rally, Israeli Yigal Amir jumped out of the crowd and shot Rabin two times from near point blank range. Less than an hour later Rabin was pronounced dead at a Tel Aviv area hospital. Amir, was was later tried and convicted to a life sentence for Rabin's murder in addition to six more years for injuring one of Rabin's bodyguards, never voiced any regrets for his actions, which he claims were in accord with Jewish religious law because Rabin had betrayed the Jewish people by making peace with the Palestinians. Rabin was laid to rest on Mount Herzl in Jerusalem. Hundreds of world leaders attended the funeral including United States President Bill Clinton and First Lady Hillary Clinton, Egyptian President Hosni Mubarak and Jordanian King Hussein. Read some of the more memorable eulogies of Rabin, HERE.